Earlier in the year, The Hackers Paradise had the opportunity to review adidas Golf’s latest shoe, the Tour 360 3.0 and loved just about everything about it. Since that time, we have received countless emails about people picking up the shoes and proclaiming them the best they had tried to date. When speaking of shoes there is always two sides when it comes to our readers. Those that purchase based on style and those that purchase based on performance. 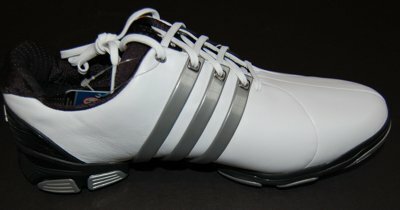 The adidas Golf Tour 360 3.0’s blended the two together in a show that had very few issues overall. 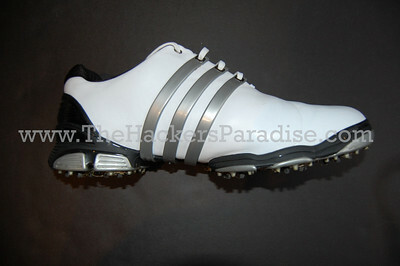 Could adidas Golf possibly improve upon the design and make a better shoe than that of their previous model? We will know by the time this review is finished. The new TOUR360 4.0 utilizes a proprietary new low-profile outsole system called Advanced THiNTech with PINS (Performance Insert System). By working closely with professional athletes around the world across all sports categories, the adidas Golf team discovered immediate performance advantages in getting the golfer lower, but was previously limited in how low they could go. When the adidas Golf Tour 360 4.0’s arrived in our offices, the first thing that we did here was compare them to that of the 3.0 model. The looks alone are different with subtle changes that we really prefer. The one that stands out the most is that the 3 bar logo on the 4.0 is slightly different on each side of the shoe. This adds some contrast that is a nice addition. The heel section of the shoe is a solid color now rather than a hybrid type of the 3 bar logo. The toe stitching is completely different, in last year’s model it was completely uniformed and with the 4.0’s the stitching is more foot conforming. The major differences stand out as you turn the shoes over to reveal a completely overhauled design in the performance area of the shoe. From just appearance alone you can see that the bottom (cleat section) of the shoe reveals a lower to the ground style that should make it an interesting comparison between the two shoes. Arming my feet with the adidas Golf Tour 360 4.0 shoes I was ready to take the range and the course for our first trial. One quick note is that the shoes feel slightly lighter in overall weight to that of that of the previous version. Most likely because of the cleat system, but this was definitely a nice surprise. At the range a couple of things stand out and the first one being extreme comfort. No breaking in period at all, you put them on and they are as comfortable as any we have tried on. Soft, good stability, and great cleat gripping on the bottom. Whether it is reality or not, the shoes definitely feel as though you are walking closer to the ground and this adds something that I have never thought we would use to describe a golf shoe and that is “feel”. Wearing these shoes gives a certain feel to the ground that is different than what we have tried before. By the time our initial testing was complete, we had learned a couple of things. 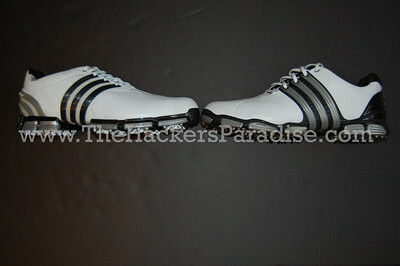 First, the adidas Golf Tour 360 4.0 shoe is as comfortable as any we have tried on to date. Second, while we loved the previous version of these shoes, the newer line is more comfortable and easier on your feet. This is something we were not sure could be done with the love we had for the Tour 360 3.0 line. After 1 round there was no foot fatigue and the shoes overall felt like a winner. THP tests and reviews a lot of golf shoes. We have certain criteria that we look for when talking about a shoe and in many cases it is personal preference and we urge everybody to try every pair on to determine if it is a fit for them. When reviewing shoes we have these categories that we look for. For the purpose of this review we are going to break down a few of these categories and give our thoughts and whether or not the adidas Golf Tour 360 4.0’s measure up to the standards we have come to expect from this brand moving forward. Style – I prefer the subtle changes that they made to the new line in comparison to that of the last generation. While we loved the looks of the 3.0 line, the new version adds and takes away in all the right places. This is purely subjective, but overall we simply love the look. The previous line was very futuristic and technical looking. Something we enjoyed. The 4.0 line is much more classic in the right places even if the changes are quite subtle. Comfort – THP has put these shoes through 15 rounds of golf and over 20 range sessions and they are some of the most comfortable we have ever worn. Soft and supple to the touch, but stable and performance driven at the same time. The adiPRENE heel cushioning they use is as good as any we have tried and adds some shock absorbing features that we are not used to. The back end of the shoe (achilles section) is as soft as a pillow and really gives almost a custom feeling to your foot. As mentioned previously, there was virtually no break in period for us at all and from day 1 we never experienced any discomfort. Construction/Durability – There are a million things going on technically in performance golf shoes and most of it are things that we just do not understand. When it comes to construction we look at the shoe bottom for issues as well as what we feel will hold up long term. Testing these out in FL gave us the ability to really look at the waterproofing. Not a single bit of water came through from wet grass or rain during play and this has been a wet month for us. The bottom of the shoe (cleat area) is incredibly unique in its own right. The added grip that the low-profile THiNTech cleats offer are different than we expected. We have seen small additional grip like features in other shoes, and with the exception of a select few, we found them just not to work. adidas Golf used the proper height and placement of each cleat and because of that, you can actually feel added traction and support. Something that we did not expect, but was a welcome addition. 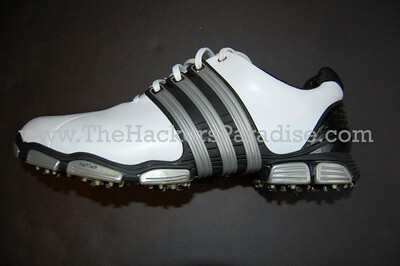 Playing Golf with the adidas Golf Tour 360 4.0 shoes is unlike what you would expect…In a great way. When looking at golf shoes, we have the criteria we outlined above as a measure to determine what stands out and what are likes and dislikes are. During the course of testing these shoes, one thing stood out more than any other though, and that is while playing you actually forget that you are even wearing them. The extreme comfort and support they offer “takes you away” from your feet entirely and that is something that we normally are not all that familiar with. The Tour 360 4.0 are available at retailers everywhere with a price of around $180. For more information on color choices and when each style is available check out this section of their site at www.adidasgolf.com. I got these in Vegas a little while ago and the review hit the nail on the head. They feel like you are lower to the ground and it is like you are wearing comfortable walking shoes. I want to see what other colors they come up with next year. I loved the 3.0s. Got two pairs and am really anxious to try these on. I’ve already gotten my new shoes for next year but may try these on and see what happens. They sound like a great shoe and now I wish I had waited. I really like these shoes. I found the old version too narrow in the width. Any change in the new 360 4.0 version? I hope so. While I did not struggle with width in the previous version, I can tell you that these are not quite as narrow as before. I can also tell you that they are more “giving” and more comfortable, so I think that they will fit more people overall. Love the clean lines – solid, fast. Picked these up recently and absolutely love them. Best golf shoes I have tried. Wish they would bring back a few more colors though. I like the look of both of them. Not sure I have a preference, but I see what you mean about these being more classic. Tried them on and they feel great. Most comfortable pair of shoes i have ever tried. I’m very much in market for a new pair of golf shoes for the 2010 season, the 4.0 are definitely going to be on my short list- glad you liked them and can’t wait to try them. Thanks for the review! Great review as usual JB. I own a pair of these compliments of another contest I won and I must say they are my new favorite shoes. I’ve never owned adidas, but would buy another pair after these. I bought a pair of 3.0’s and they are the most comfortable pair of shoes I have ever had! I was a big fan of Footjoy before but not anymore. I’m going to have to put a pair of black 4.0’s on Santa’s list. This review is really making me want a pair of these shoes. There are few things that are more important to me on the golf course than feet that don’t get tired and sore. Keep your base happy. We really enjoyed the 3.0 sports last year and the 4.0s are slightly different. Stay tuned for our new Powerband 3.0 review coming up next week for a more affordable adidas Golf shoe that we think is worth its weight in gold. I absolutely LOVE the 3.0 Powerband style (particularly the white base w/ black trim) and its price is fine, but my heel didn’t stay put in them enough for me to purchase. Plus, the sole difference between it and the 360’s technology is the 360 wrap. I have terribly unstable ankles, flat feet and wear orthotics, so the additional stability touted by the 360 wrap is drawing me nearer to the purchase of the 360s. Thanks. just bought it at adidas store,cant wait to go for a round of golf wif it. Loved the 2 previous generations so got a pair of 4.0 on May 15th, first time out on the course I got blisters on the back of both feet (achilles section), so for the rest of the 1st month I started wearing thick socks to dampen the pain and hopefully break them in (even though it was 33 degrees C temp here!). 2 months after buying them the cloth in the back section of both shoes is already torn and the plastic heal shell is bare… I have taken the shoes back to the store and am waiting for Adidas’s verdict but there must be something wrong with that specific pair… at least that’s what I hope as I love the look and also the feel in swing.